The regional arm of the National Labor Relations Board (NLRB) ruled last week that Northwestern University’s scholarship football players have the right to unionize. This is only the first step for the players, who will likely face an appeal from the University to the NLRB’s full board in Washington, D.C. If the initial ruling passes muster with the NLRB, it can also be appealed to the U.S. Supreme Court, so there is a long road ahead for this case that has exposed quite publicly the tensions within big-ticket college athletics. 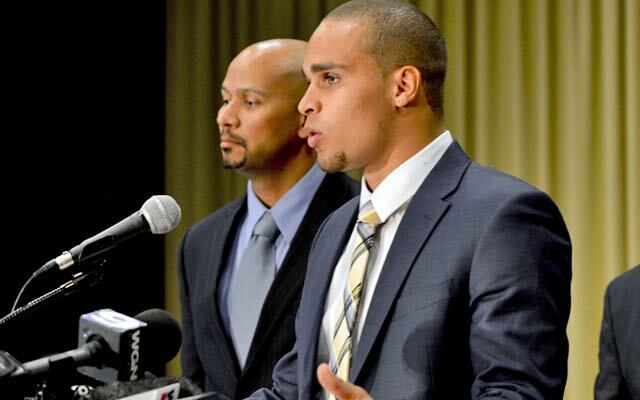 The crux of the case is this – do scholarship athletes qualify as employees of the University? Leo Gerard, President of the United Steelworkers (who are providing material support to the Northwestern athletes), recently summarized the students’ demands, which include greater medical coverage – including post-grad coverage – for injuries sustained on the field or court, support to minimize the threat of concussions, and an educational trust to support former student athletes. Athletes are usually given scholarships one year at a time, so injuries or issues off the field may derail future support for their education. Gerard and the students argue that universities are making so much profit off of football and men’s basketball programs that the wealth needs to be shared equitably with the athletes themselves. The players believe that unions will help protect them. They may be right, but I see this as another step in the commercialization of academia. The players’ argument is part of a broader belief among administrators, boosters, and commentators that college athletics, particularly football and men’s basketball, are financially beneficial to universities. There is a small empirical literature to this effect (see, for example, Goff 2000), and the top football programs do bring large sums of revenue into university coffers. Most Division 1 football programs, however, do not bring in more revenue than they cost to operate. The benefits touted by many administrators about school spirit, alumni fund raising, and increased applicant pools may not be as pervasive as university leaders believe. These benefits may also be offset by widespread indifference to athletics by a majority of some student bodies. On the academic side, many instructors will share tales of frustration – coaches intervening on behalf of student athletes, shoddy attendance, and student athletes whose academic abilities appear to be far below that of their classmates. On the whole, graduation rates are comparable to the overall student body for many sports according to the NCAA, though male football and basketball players graduate at lower rates than the student body as a whole. And forget about going pro – the NCAA’s own data suggests that while college athletes go pro at greater rates than athletes straight out of high school, the numbers are still exceptionally small. So what is going on here? First, I want to suggest that the question of exploitation is complicated, and not simply about surplus monetary value. The players argue that they spend nearly 40 hours a week generating value for the university both in terms of revenue as well as the intangible benefits that administrators tout when discussing the benefits of athletics for universities. For the top football programs, this is undeniably true. In 2011-2012, Alabama spent $37 million on its football program but brought in nearly $82 million. But what of all of the other athletic programs whose revenue falls far below the cost of the programs themselves (e.g., swimming, rowing, soccer, volleyball, wrestling, and the list goes on and on)? I think that we need to look past the surplus monetary value created by athletics in these cases. Universities have many non-financial reasons for funding athletics, and in all cases it is the athletes themselves who are contributing their labor power towards surplus emotional, if not monetary, value. It is worth remembering that most other sports, even at the NCAA Division 1 level, do not generate profits for university athletic departments and most departments require subsidies to stay in the black. For men’s basketball and football, however, does this make student athletes university employees, as the players at Northwestern argue? I don’t believe so. Many students contribute to university communities in a variety of ways, often to the same ends of leadership and campus involvement that administrators tout as a benefit of athletics. The efforts of student government representatives, college thespians, campus musical ensembles, and other social groups all are directed at the same ends of campus involvement and leadership that are part of the student experience. College, after all, is not just about classroom learning but about everything else that comes along with being at school – exposure to new people, new ideas, new things. Sure, these efforts may be time consuming – students who work on theatrical performances, are members of student government, or participate in other organizations often put as much time into these pursuits as athletes do into their respective teams. And they certainly rely on the creation of surplus emotional value. Framing athletes as employees misses that point. Creating surplus value may be exploitative, but the solution should not be to codify such exploitation by engaging in a wage relationship with students, whether it is working on a play or working in student government. I think that the logic of the athletes-as-employees argument is symptomatic of a broader problem – a belief that simply paying athletes more or giving them additional benefits will make the (supposed) economic blockbuster that is Division 1 football and men’s basketball suddenly not exploitative. This is a fundamental tension within capitalist economics, and it is not surprising that it has found its way onto the court and the field, particularly as universities continue to act more and more like for profit enterprises and less like the non-profits they began as. The conversion of the student relationship into the customer relationship is now being subsumed by a move to make them both customers and employees. Unions may protect student athlete interests, but they also further entrench this process of commercialization. The solution, in my mind, is reframing the student athlete experience. It is interesting that the NBA and the NFL – the two professional leagues for men’s basketball and football, respectively – do not have strong farm team systems like hockey and baseball. Instead, they rely on college Division 1 basketball and football programs as training grounds for their future professional athletes. Universities need not accept this status quo; most are not benefitting financially from this arrangement and the expectations students have about their athletic careers are typically unrealistic. Universities, the NBA, and the NFL could discourage players from making the jump to the big leagues too soon and place an emphasis on their lives after athletics, but then again football and basketball have the shortest average career lengths of the major leagues so there is an imperative to get players on the field before injuries end their careers. The NBA and the NFL also benefit from perpetuating the myth that any player could make it, since this gives them the deepest talent pool to select from. Absent support from professional leagues, university faculty and administrators need to work together to reject the profit seeking motives within higher education, particularly in atheltics. They need to work with student athletes to keep the focus on the student aspect of student athletics. These are not employees, and while athletics may be what gets some students in the door, it is their college degree and not their athletic skill that will carry the vast majority of them for the rest of their lives.